It wasn’t long after the first man landed on the moon that I attended a conference as a Youth Representative of The Boys’ Brigade. One speaker took the theme of landing a man on the moon and spoke about the involvement of massive teams of people with various skills, all important no matter how menial the task seemed to be, and yet their names never recorded in history. I think of the BB family, of which I am proud to call myself part, as a big team all working together united with a common purpose of advancing Christ’s Kingdom among Boys but also among the men and women who serve in our great movement. Often, we will never know the impact that our actions, our enthusiasm, our dedication, our commitment has had; and I wish I had the opportunity to properly thank those people who gave me so much. However, I believe that they would appreciate my way of saying thanks is to strive to offer that same commitment to succeeding generations. To my fellow leaders I say be aware that you are often doing much that is good by simply showing you care! The speaker at that conference also challenged us to “Shoot for the Moon!” He pointed out that even if you miss, you’ll find that you have gone higher than you could have imagined and just possibly will find yourself amongst the stars! 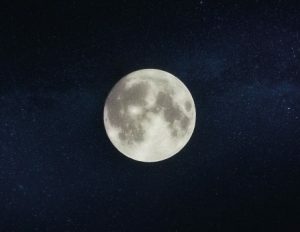 Will you share that mission with me “Shooting for the Moon!” It’s about aiming for what some would say is impossible, raising the bar, about the level of expectation and of challenge. Inherent in high aspiration is quality and that requires training, dedication, and mutual support. Let us always strive to be the best that we can be. Like the Apollo team, we need to define our mission. I suggest that paraphrasing Luke 2:52 could be our mission: to encourage, support and challenge our young people to grow in body and in mind and in favour with God and man, in other words to grow more and more like Jesus as whole human beings. It will be impossible to become the perfection of humanity that is Jesus but in aiming to be like the king, we will truly be advancing Christ’s Kingdom. Derek joined the BB as a Life Boy in 28th Edinburgh Company and continued on to become an officer after training at KGVI. 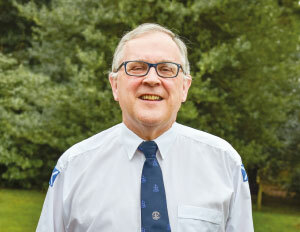 After working in telecoms, Derek was appointed as BB Field Officer, North Scottish District in October 1978 but was unable to attend his first meeting of District Council as he was being married that day! The BB experience was formative in the decision to becoming a minister in the Church of Scotland. After training, Derek served as Parish Minister at Falkirk Bainsford and then worked operationally in the governing grades of the Scottish Prison Service, before returning to Parish Ministry at Airdrie Clarkston, retiring from there in September 2017. Although having served as a Company, Battalion and now Scottish Chaplain, Derek still thinks of himself as being a fully trained BB Lieutenant. Married to Pat, and with three grown-up children, David, Caroline and Susan and two grandchildren, Alistair and Emily, Derek now lives in Falkirk.